Ancient Prophecy hails from Germany and formed back in 1996 with only three members Florian Kraus(Guitars), Daniel Keck(Bass/Vocals), and Michael Slansky(Drums). After some time, Michael left and was replaced by Lynn André Neissner who became the new Drummer/Manager. Shortly thereafter, two additional members joined the band Andrea Busch(Vocals) & Tobias Buss(Guitars/Vocals) and the band was then complete. 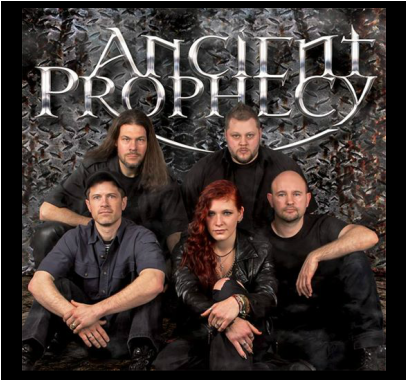 Ancient Prophecy is known for their female fronted, Heavy Power Metal. Even though the band is from Europe where the Power Metal is often known to be of the lighter fluff variety, that's not what we find with this band. What we find with A.P. is quite the opposite, having enough force and ferocity to level a ten story building. In an interview at ghgumman.blogg.se, the band states that they want "To make good metal music that expresses our faith in Jesus. None of us wanted to be a pastor or study theology; we’re just followers of Christ and want to spread the good news and play music for our Savior." In 1999 Ancient Prophecy released a full length Demo album called 'Days Of Doom' which consists of nine tracks. The musical direction on this album was of Gothic and Classical styles of Metal. The album was recorded by Andi Gutjahr(Guitarist for Lightmare). During the following year the band spent a lot of time practicing, playing concerts, and participating in interviews and CD reviews. This time frame gave way to some more line-up changes, and then Timothy Bostick(Bass) and Jacki Kunz(Vocals) joined and began contributing their many talents with the band. In 2008 Ancient Prophecy released a 3-track demo called 'New Chapter'. This release combines elements of Death Metal & Power Metal. What do you get when mad scientists take elements from various genres of music like Power Metal, Speed Metal, Thrash, Death Metal, Progressive Metal, & then mix it all with clean 80's style Vocals? Well, you get a lethal concoction called 'Ancient Prophecy'. Even though the band draws from a vast array of genres, the predominant genre that rises to the forefront of their music is that of Power Metal. Out of fun, the band has nicknamed their concoction "Prophecy Metal". Female fronted and lethal to the core with some respectable Power Metal offerings, Ancient Prophecy, with their 2015 'Pounded By Our Sins' release, is poised to take christian Metal by storm. It's hard to go wrong with songs like "Metal Is Still Alive" which is a anthem theme song so to speak. In the christian Metal community we have seen a fair share of Metal theme songs coming from bands like Rob Rock(Metal Breed), and Ultimatum(Heart Of Metal). "Metal Is Still Alive" makes a fine addition to this list for all Metal Heads to appreciate and enjoy. 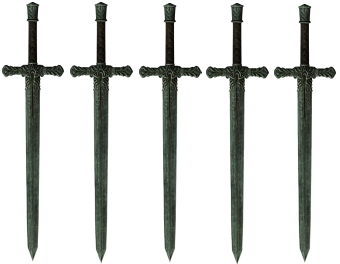 And take your sword to start the fight. To trust in God and fight against the dark. Some other tunes that really stand out on this 2015 release are "New Chapter" , "Pounded" , "Brightness In The Dark" , "Look Into My Soul" , "The Fall Of Vanity" , & "Eternity". Well that covers most the album so you might as well just invest in the whole album. Vocalist Jaqueline Kunz does a fine job with her Vocal offerings on this sophomore release which is her first project with the band. The best comparison that I can make with Jaqueline's Vocal style is that of 80's Pop Rock Vocalist Pat Benatar. Jaqueline takes on similar Vocal variances as Pat Benatar in that she can be singing in a normal mid to upper range and then reach for a gritty style delivery and then round it all out with a sweet-innocent delivery. Jaqueline's Vocals are very promising and can only get better as she pushes herself to new levels. The heavy-smokn' Guitar work is brought to us from Tobias BuB & Florian Krausa who both do an extraordinary job of laying down the riff. We find plenty of guitar variance between Tobias and Florian that will keep you coming back for more. The riff goes from Heavy to driving-Power to Thrash to Speed and to general modern day noodling. If you are a Thrash fan, like me, then you will find plenty to get excited about here. Also, there are plenty of solos laced throughout the album that give the listener a break and a chance to appreciate the guitar riffs. It's also worth mentioning that Tobias BuB is responsible for the very well done Death growls that you hear throughout the disc. The Growls are unique in that they vary in intensity depending on the tune that they are presented in. There is no way to listen to this album and not be taken back by the drum work of Lynn Andre NeiBner. His work is nothing short of brilliant with the many different time changes that he delivers up. The pounding begins with the opening track and never lets up giving one plenty to enjoy throughout the entire album. Some of the styles of play that Lynn Andre offers up are that of Thrash-hammer pounding, to Speed Metal to blast beets and everything in between. The only drummer that I can think to compare Lynn Andre with is Ted Kirkpatrick (Tourniquet) where the drum work is more than just keeping time. No band is complete without a Bass Guitarist who adds depth to the music. Bass is handled by Timothy Bostick who does a fine job of adding an additional heaviness to the overall sound on this album with his terminator bass lines. We find the band talking about their lyrical direction from the interview @ ghgumman.blogg.se-Where the band states: "We all love metal! Our songs are about our faith, about how we face the challenges and suffering life throws at us, and about how Jesus has helped us through the tough times. We all sometimes do bad things and make mistakes, and we are all eventually going to die. God tells us that nobody is able to escape this condition or fate without His help. Jesus Christ is the one who showed us the way by being punished and executed for our sins, like a sacrificial lamb. It’s His blood that will make us right in God’s eyes and bring us to Him. All we have to do is trust Him and believe that He’ll save us from eternal separation and death. That’s the message our songs try to convey." Twisting and turning unable to sleep. I can't stop thinking no chance to fall asleep. So angry about the dreams that keep me awake. My mind is running running all through the night. So many doubts about who I am. A life full of shame. Oh Lord look into my soul, raise me up, and make me whole. Let me feel your grace again. Release me from my pain. Raise me up and make me whole. Feels like I am losing myself. This vessel has been destroyed. Release me from my sins. Like in a world that won't understand. 'Cause this is my cry for a helping hand. The world comes closer to a deeper nightmare. That is embracing me at my conclusion? Seeing the world break in the haze of war. The breakdown of faithless mankind. The major fault will become apparent. My mind is not at ease – my opinions are not real. When I’m alone, I’m doing things I should not do. When I cannot stop, they cause my downfall. The sin will not win – I have to be stronger. But alone I will not manage – I need help. Could it be the truth? Is it meant for me? Who is this strong, brave Savior who shares His blood with me? I heard about Him when I was a child but one day I forgot Him. And now in the hour of trial He’s calling my name. I can’t believe He was always there; why was I so blind? His voice could not be heard. Please, please tell me what I should do. I didn’t realize that You were always by my side. I have to say sorry; it wasn’t meant like this. I never intended to close the door before Your face. I’m at a loss what to do; tell me, what is the next step? The days I was faithless have been counted; please, save me from my sins. So I will go tell the world, that the vanity must end. It must be the time that they accept that You can heal the world. The vanity of politicians and visions must fall. The devil tries to pull us down, in every single way. (See Site Info for Sword Scale Meaning) This rating is for the album "Pounded By Our Sins"
If you like groups like Tourniquet or Theocracy and you don't mind a female fronted band then your in good hands here with Ancient Prophecy. The album "Pounded By Our Sins" is highly recommended to all Metal loving Metal Heads who are looking for new music that is sure to move you and get you Rock n' for the King.